The MDS-6EXTF extended-length, flush-mount, mid-rise lift is the ideal solution for quick-lube stations looking to install a car lift flush over their work pits. If your shop wants to be ready for longer-wheelbase vehicles and minimize the lift's footprint, you can’t do better than this. Waves of electric vehicles will soon be pouring into service bays. Even lube stops need to be ready to service these vehicle types, not for oil changes, but many other profit-earning maintenance and repair services (e.g., wheel and brake service). Electric vehicles are tricky to service. Some, like Tesla™ models, have OEM jack points that are on the far edges of the chassis, near the wheels. Most low-rise and mid-rise lifts can't reach these points. We redesigned the MDS-6EXTF to not only recess into your bay's concrete for a near-zero footprint, but this ​lift is long enough to accommodate hard-to-reach lift points on electric and other long-wheelbase vehicles. Smaller vehicles are just as easy to service with this model. An air-powered "kicker" acts like a mini-booster for the lift platforms. This ensures that they lift fast and evenly for the first ​152 mm of rise. Why do we have this feature? Because a flush-mount ​lift might be close to your vehicle's underbody before it starts lifting, and the hydraulics may not be able to generate sufficient force in the early going without a little help. This is a physics problem that all hydraulic systems must face, and BendPak resolves it with a little help from simple, rugged pneumatics. Once a car pulls over your pit, it's important that your flush-mount ​lift generates a ton of force in a short period of time. To increase the durability of the hydraulic system and reduce stress on individual cylinders, the MDS-6EXTF features four cylinders (two for each side) instead of just two. All four work together to achieve ​1,143 mm of lift in only a few seconds. Automatic mechanical locks engage as the ​lift rises. Rugged steel construction offers absolute peace of mind for busy bays. When your ​lift is flush-mounted, the last thing you want to worry about is maintenance. That's why we've done away with spring releases in favor of air locks. They're virtually indestructible, maintenance-free and equally as safe as springs. The only difference is the requirement of 50 psi, 10 CFM air during installation. With the push of a button, the air locks release. This system is safe, fast and extremely cost-effective. A flow divider keeps the ramps moving simultaneously in either direction. Zerk grease fittings protect critical wear areas from friction and degradation over time. They're self-lubricating and rarely require maintenance. Hard rubber lift blocks come standard with your ​lift. These blocks safely engage vehicle frames from a flush-mount position. They're designed to grip frames and stay put, no matter what. Three lock positions make it fast and easy to pick a comfortable working height. Raise vehicles just a few inches over the pit for quick oil changes and wheel swaps, or go to full extension for exhaust work, transmission drops and other involved procedures. Detailed instructions are included to provide you with installation, maintenance and warranty information. All of this can also be found free of charge on our website, or by contacting our headquarters via email or phone. If you happen to lose some safety decals (or they wear out) or your entire manual, we'll gladly help you replace these critical components at no cost to you. 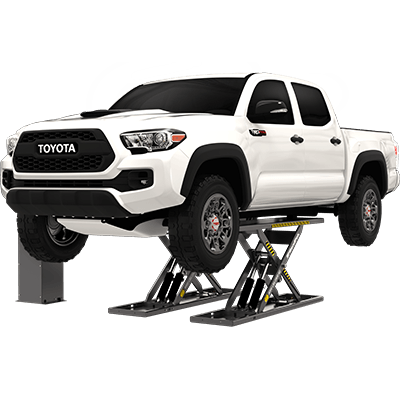 NOTE: The lift platform and contact blocks allow lifting of most unibody and frame contact undercarriages at recommended manufacturer pick-up points on most vehicles. Be sure to compare your vehicle specifications, including ground clearance and overall height, with the specifications shown before you purchase.